On May 17, 1923, seventy-seven children and adults died in a tragic fire which consumed the Cleveland School located just off I-20 near Camden at Exit 101 across from the Equine Park. As a result of this fire and the large loss of life, public outcry at that time focused attention on the issues of fire safety in places of assembly and pressured our elected officials to enact legislation which began to shape building and fire codes not only in South Carolina but throughout the Nation. However, in just a few weeks, on May 17, 2015, most South Carolinians will likely go about their day and business without any inkling of the heartbreak of that fire and the needless deaths of many people, mostly young children. Only descendents of those who died on that fateful day will observe its significance and the impact it had on the small, rural community. Sadly, the happenings of that night have long been forgotten by most. Even the fire service in general has never even heard of the Cleveland School Fire, or, at least the reflections of that event don’t cross our minds much anymore. So, join me as we travel back in time 92 years ago to examine the incident that brought change to a small community, to our State, and to the Nation. According to a number of articles published over time, the Cleveland School was a two-story, wooden structure that accommodated almost all grade levels of children. We are told that only 3 teachers were employed by the school to teach the children. Accounts reveal that it was a long-standing custom that on the night of graduation, the students would offer their families and friends a production or play to celebrate the conclusion of the school year. Even as today, a play put on by our children and grandchildren is a big deal. It’s interesting to note that the play was to be the last held in the auditorium because the school was to be closed after the school year, and the children would be moved to other schools within the county. Ironically, the name of the performance was “Topsy Turvey”. A crowd of some 300 people, mostly family and friends, poured into the school auditorium which was located on the second floor. Obviously, the number of children and patrons attending the event far exceeded the capacity of the auditorium, but there was no hint of concern about overcrowding or effort to monitor and control the number in attendance. Electricity had not made it to the rural areas of South Carolina, so lighting was provided by oil lamps which hung on nails near the stage area. About 9:00 P.M. when the last act of the play was beginning, a lamp fell from the wall spilling its flammable contents on the stage. The fire spread rapidly, and a number of men in the audience removed their coats in an attempt to smother the growing flames. We are told that at first the efforts to extinguish the fire seemed to be working. The patrons in the crowded audience realized what was happening and began to move towards the stairs in an orderly fashion in an effort to evacuate the building. However, the flames from the lamp raced to the stage curtains which served as a backdrop for the production. The curtains were made of flammable material and contained no fire retardant rating to slow the flame spread. The fire spread over all the stage area and danced across the ceiling. Conditions inside the entire building deteriorated rapidly with both heat and smoke beginning to take its toll on the people trying to exit the old building. As one can imagine, frantic parents tripped over chairs lining the walls as they attempted to reach their children gathered near the stage area while others pushed and shoved their way toward the school’s only narrow stairway. When panic began to take over, some patrons opened windows and jumped the 15 or 20 feet to the ground. Accounts of the fire reveal that some family members tried in vain to reenter the building in an effort to find their loved ones, and those who successfully reentered the structure ultimately lost their lives. One narrative tells of a father reaching his daughter and was observed through a window holding her in his arms as the fire took possession of the building. When the stairs began to fail and the second floor collapsed into the first floor, the fears of the survivors became a reality too horrifying to truly comprehend. Sometime at the height of the fire, word spread throughout the community and eventually an alarm of fire was transmitted by word of mouth to the Camden Fire Department some 6 miles away. The Camden Fire Department sounded the alarm of fire to muster its volunteer firemen and quickly deployed its 1920 model Seagrave having only 300 gallons of water on board. It was slow going for Camden’s engine which had to travel the nearly 6 miles to the carnage awaiting them. Obviously, when the fire department arrived on the scene, little could be done to help those trapped in the remains of the old school. We are told that identifying the bodies was extremely difficult. For those bodies which could be identified, relatives claimed their remains and took them away for private burials. 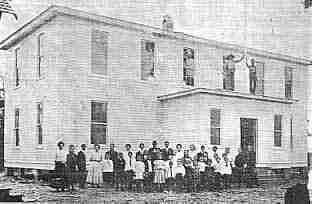 Sadly, 67 unidentified bodies remained, and it was determined that since they “died together, they would be buried together.” A mile away from the Cleveland School was the Beulah Methodist Church and Cemetery. It was decided to excavate a mass grave (12 feet by 40 feet) in the Beulah Cemetery to serve as the final resting place for those who died in the fire and who could not be positively identified. Accounts indicate that somewhere between three and five thousand people attended the funeral. When the embers had finally cooled, reaction throughout the State was one of shock, great sadness, and alarm of concern for safety. A cry of change stretched across the State, especially within the fire service and the State’s General Assembly. Charleston’s Fire Chief and President of the newly established State Firemen’s Association, Louis Behrens, fueled that cry of change by personally traveling the State visiting fire departments to seek their support for new laws to increase fire safety especially in places of assembly. Under his leadership, Chief Behrens inspired the fire service to contact their legislators to introduce laws that would address the weak building and fire codes in existence at that time. In addition, national fire service organizations, including NFPA, took up the call for strengthening building and fire codes. As a result of that initiative, State and National codes were changed and adopted which required adequate exits and exterior fire escapes, alarm systems, fire retardant materials and contents, capacity guidelines, improved lighting and heating installations, portable fire extinguishers, mandated exit drills and training for staff personnel. Even today a law remains which requires every school district principal in the State to provide verification that fire drills have been conducted in his/her school throughout the year. Over time a monument was erected at the site of the fire as well as at the Beulah Cemetery. Bronze plaques lists the names of those children and adults who died in the tragic fire. In conclusion, as we pause to remember the events of May 17, 1923, and consider those who died in the Cleveland School Fire, may we continue to pursue the orderly pursuit of enacting more modern building and fire codes to keep pace with improved technologies, ie. residential sprinklers. Also, I wish to encourage all of our readers to take a field trip to visit the site of this disaster, the final resting place of those victims at the Beulah Cemetery, and include a visit to the Camden Fire Department to see the restored Seagrave pumper that responded to the alarm of fire on that fateful night. I wish to acknowledge those who contributed to this article: Fire Chief John Bowers, Anna Inbody, and Craig Swain whose research is extensive and so interesting.